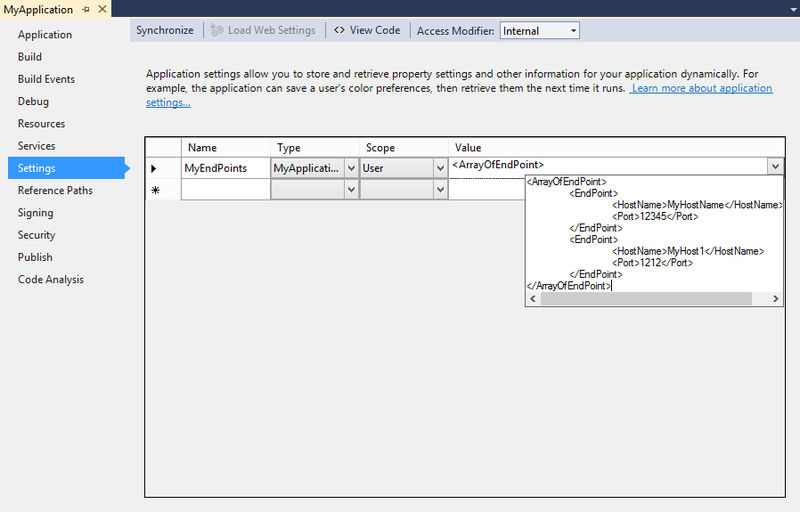 Just now I came across ApplicationSettings in .NET WinForms that could handle complex types. Currently I am using AppSettings in my ASP.NET WebForms which can handle only string. Can I use ApplicationSettings in Webforms? If so how? Build the project containing the classes. Go to the Settings tab in Project Properties. It will say that there is no settings file yet and ask if you want to create it. Add a new settings file. In the type field select Browse and type the full class name. For example: ClassLibrary.EndPointCollection. Save and rebuild the project. Hit the edit button for the setting value. (Note that this will not be available if the classes made in the earlier step are in the same project.) Use the UI to edit the settings. The designer will have created, behind the scenes, the strongly-typed objects to allow the above to work. You can see the full details in the Settings.Designer.cs file. Bottom line: you can make all kinds of custom type settings, as long as those settings have XmlSerializable or have type converter. This technique works on Web Applications, WinForms, WPF, Console Applications etc. 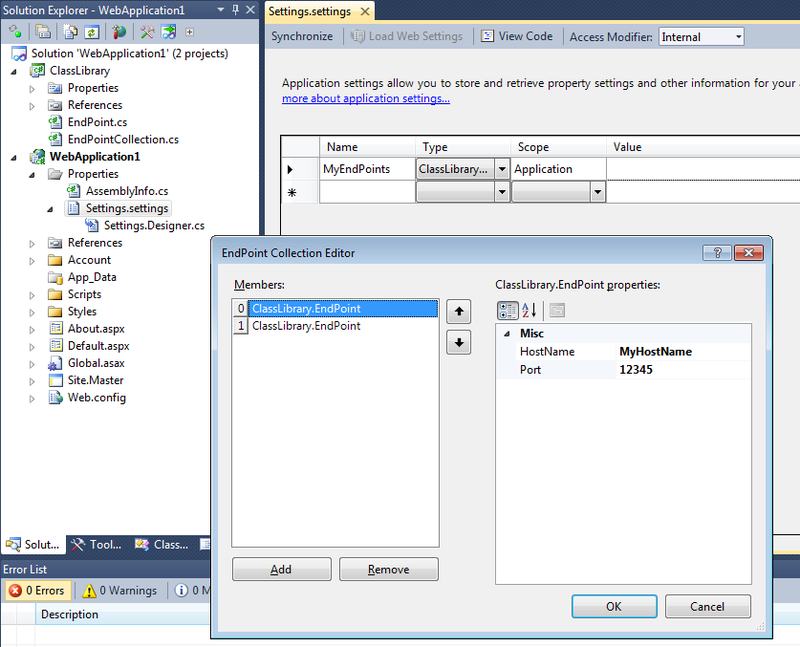 The accepted answer proposes the use of a specialised collection class, EndPointCollection to hold settings. However, I don't think this is necessary; an array type (EndPoint) also seems to work. Note that the XML namespace declarations that Visual Studio generates aren't necessary in the XML, as shown above.